A young, vibrant organization prides itself on the open and flexible culture it has. An older, stable organization, prides itself on the structured and process-oriented culture it has. Why are we talking about different kinds of organizations and their cultures? Simply because, the culture defines the identity and culture does not get created overnight. It gets developed over a period of time, because of the policies that the companies put in place. Because from the policies, arise the rest of the Ps – processes, programs and practices. That itself, should be the primary reason for having policies. That, and some more reasons shared below will give you an idea of why you, as an organization, need to have policies. More often than not, what is happening in the external market is not what bothers an employee. What happens with respect to the person in the next cubicle or table is our bigger concern, as employees. That’s what matters – internal equity. A policy makes sure that this becomes an essential part of your organization’s fabric. The same provisions apply to everyone. The same rules of what needs to be done or how one needs to behave or even what one is entitled to, apply across the organization. Why do employees leave organizations if the pay and role are fine? It is because there is a disconnect or misalignment of values. Policies define the organization’s values and what it stands for. When you have a policy, it communicates the same values to all the employees. That is why it is important because alignment of values is what leads to overall business impact. Not only the values, there is alignment of thought-process as well, when it comes to policies. All employees are able to interpret it the same or in somewhat similar manner. The best way to reflect the needs or motivators of employees is through policies. You have a younger workforce that wants flexibility? Put a good flexi-work arrangements policy to enable them to work better. You have older employees who crave stable benefits? Create a comprehensive insurance policy that meets their health requirements. Policies can make a difference to employees, since they send the message that the organization empathizes with their life situations, and wants to assist them with those. These are some big reasons that your organization needs policies. We need to think beyond policies as documents to enforce some rules or regulations. Policies are what you want them to be, depending on how you define them. Organizations that understand that the purpose of policies is not really to keep employees in check, but to ensure that they have an emotional connection with the company, are great examples. So, do think of policies as a roadmap for effective people management, and not a framework to construct. At KelpHR, we take pride in designing, rewriting the entire company policies for some marquee clients. 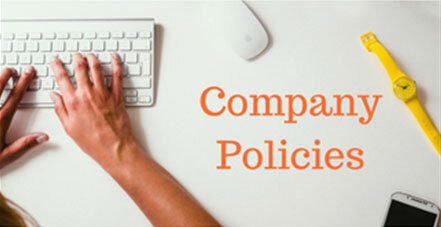 Do reach to us at info@kelphr.com for more details on company policies.